In 2005, when the administration rezoned Williamsburg's manufacturing land to residential and mixed-use, DCP issued an EIS that said the rezoning would have no adverse impact on business displacement. By 2014, according to one study, three of every four manufacturing businesses had disappeared. In 2001, the Bloomberg administration rezoned Long Island City’s manufacturing land to “mixed use” to promote commercial and limited residential development. As required by state law and city policy, the Department of City Planning (DCP) issued an Environmental Impact Statement (EIS), a document analyzing the potential impacts of a land use change. That EIS said the rezoning would likely generate a few hundred residential units but that there would be no need for new schools, police facilities or firehouses. Fourteen years later, more than 10,000 new housing units had been built, and though six new schools have been added to the area, Long Island City ranked among the top 10 most overcrowded school districts. Then in 2005, when the administration rezoned Williamsburg’s manufacturing land to residential and mixed-use, DCP issued an EIS that said the rezoning would have no adverse impact on business displacement. By 2014, according to one study, three of every four manufacturing businesses had disappeared. The city conducts its environmental review process according to the guidelines of the City Environmental Quality Review (CEQR) Technical Manual. That manual was created by the City Planning Commission in 1993 and was the product of an inclusive discussion based on feedback from a variety of civic organizations including New York Lawyers for the Public Interest, the Municipal Art Society and Nos Quedamos Community Development Corporation, according to Ron Shiffman, who was part of the City Planning Commission at the time. For today’s urban planners and community advocates, it can be hard to remember the manual’s democratic roots. Instead, many advocates deride the environmental review process and accuse it of shielding developers and city planning agencies from lawsuits while failing to protect neighborhoods from the negative effects of development. And while planners and community activists dislike the EIS because of its limited scope and power, private developers have a different complaint: the time and expense of preparing it. Mayor de Blasio has discussed rezoning as many as 15 neighborhoods to increase residential density, which bodes many more EIS to come. Cypress Hills and East New York activists in the Coalition for Community Advancement weren’t too pleased with the environmental review process in East New York, de Blasio’s first rezoned neighborhood. The EIS said the rezoning would likely increase the neighborhood’s school-age population, leading to a deficit of 761 elementary school seats and 404 intermediary school seats even with the administration’s promised new school. The manual requires that significant negative impacts be mitigated “to the maximum extent practicable,” but the East New York EIS, in its section on mitigation, concluded that the situation would be “monitored”—even though intermediate schools in the area were already overcrowded—and that if a severe deficit of seats arose, the city would use a variety of measures, including constructing a new school “if funding is available.” To community advocates’ disappointment, the East New York plan was approved with only one new school in the pipeline. Advocates in other potential rezoning neighborhoods are quickly educating themselves about the environmental review process and its pitfalls. The manual provides room for discretion, and sometimes activists are focused on making sure the city makes considerate choices. Sometimes they are fighting to ensure proposed mitigations will be set in stone. And sometimes they are demanding that the city study additional issues beyond those mentioned in the manual—or perhaps modify the manual itself. “The whole handbook needs to be revised,” says Shiffman, who is also co-founder of the Pratt Center for Community Development. “We have a different understanding of the critical housing shortage and the affordability issues than we did”when the manual was written in 1993. The manual has been revised internally by city agencies four times since then, including new sections to ensure a sustainable, climate-resilient waterfront and provide the latest science on pollution, among many other changes. Yet it’s likely that if the city held another hearing on the manual, there would be an outpouring of suggestions. Whether a project is proposed by the city or by a private developer, the applicant engages in a multistep environmental review process facilitated by whatever agency is undertaking, approving or funding the project. Often, that’s the City Planning Commission, for which the Department of City Planning carries out the review. First, DCP must hire consultants to produce an Environmental Impact Assessment (EAS), which discusses whether a full analysis of the project’s impacts, an EIS, is necessary. If it is, DCP’s consultants must produce a Draft Work of Scope describing the details of the project and what exactly will be studied as part of that EIS analysis. DCP must then host a public hearing on the scope, and, “incorporating public comments as appropriate,” issue a Final Scope of Work. This is the to-do list for the EIS itself. Next, the consultants must issue a Draft Environmental Impact Statement that assesses the impact of the project on a variety of categories, and proposes strategies to mitigate harmful impacts. DCP is required to release this draft EIS before the commencement of the Uniform Land Use Review Procedure (ULURP), the approval process through which a land-use change become law. After a hearing, DCP issues a Final Environmental Impact Statement, and the City Planning Commission must consider the final EIS for at least 10 days before it decides whether to approve the project, leading to the ultimate City Council vote. Critics of the manual take issue with its procedures for assessing both “direct residential displacement,” or displacement due to the demolition or redevelopment of buildings, and “indirect residential displacement” caused by rising rents. The manual notes that occupied rent-stabilized buildings are not likely to be redeveloped due to the difficulty, under the state’s regulatory laws, of relocating protected tenants. Yet Michelle de la Uz, director of the Fifth Avenue Committee, says the 2003 rezoning of Fourth Avenue generated so much market heat that a few property owners did demolish rent-stabilized buildings that were 100 percent occupied. The Coalition for a Community Vision, a group of community groups organizing in response to the city’s proposed rezoning of Jerome Avenue in the Bronx, also disputes the manual’s assertion that 500 or more people must be displaced before displacement is considered “significant.” The manual further states that the environmental review process is only meant to guard against extremely large-scale urban renewal projects such as the redevelopment (under Robert Moses) of Lincoln Square in the 1950s. The coalition disagrees, and is calling for a full analysis of who will be displaced, regardless of how many people are affected. “It may be reasonable to have a less stringent assessment not based upon an arbitrary number, but based upon a stated public policy that there are sufficient numbers of new units coming on line to accommodate those displaced people,” said Harry DeRienzo, the director of the community development organization Banana Kelly CIA Inc. and a member of the Bronx coalition, in an e-mail to City Limits. Critics also dispute the manual’s procedure for analyzing how many people are at risk of indirect displacement caused by rising rents. The manual defines “vulnerable population” as low-income people living in unregulated housing, but advocates say that a rezoning could cause landlords of subsidized, rent-regulated buildings to opt out of expiring subsidy agreements, incentivize landlords to illegally harass their tenants, and encourage a wave of buyouts—all of which would diminish the number of low-income people and affordable units in the neighborhood. DeRienzo would also like the city to take into account the potential “cumulative” impact of multiple, adjacent rezonings over several decades. He lists the 2011 rezoning of Webster Avenue, the ongoing Sheridan-Hunts Point Land Use and Transportation Study, and the gentrification of the South Bronx as factors that should be considered in an analysis of Jerome Avenue. 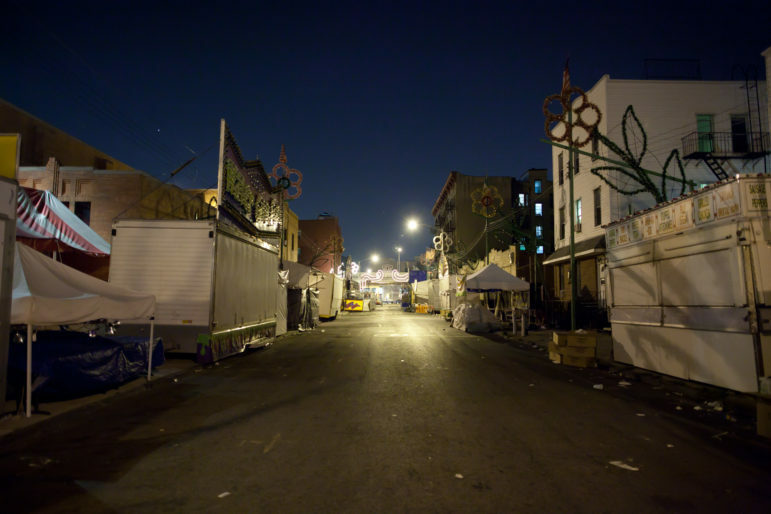 “Taken alone, Jerome Avenue might directly impact a couple of hundred residents, and a thousand indirectly. But when combined with all other past, present and future anticipated actions, the indirect and cumulative impact can reach tens of thousands over a period of time,” said DeRienzo in an e-mail. There is not much instruction, however, on how to determine what might be considered a “simultaneous or subsequent action,” or how to define what constitutes a city’s “long-range plan.” It is yet to be seen what other projects the city will include in its analysis of the Jerome Avenue corridor. A section on gangs? On segregation? Beyond displacement, critics have a number of ideas for how to expand the purview of the manual. The East Harlem Neighborhood Plan, the outcome of Speaker Melissa Mark-Viverito’s community planning process, calls on the city to assess the potential rezoning’s effects on neighborhood health outcomes, on youth and gang violence, on the well-being of the homeless, disabled, and racial minorities, and on economic factors such as workforce job quality, living wages, local hiring. No such analyses are currently required by the manual, though if a project is found to have adverse impacts related to air quality, water quality, noise or hazardous materials, the manual does require an analysis of the impact on public health. George Janes, a consultant for East Harlem’s community board, says the city needs a more precise method for estimating the impact of new buildings on school capacity. Janes points out that the manual offers a multiplier for each borough: for instance, if you are constructing a building in Brooklyn with ten units, you would take the Brooklyn multiplier of .29 and multiply it by ten: that development would likely generate three new elementary school students. Yet these borough-wide multipliers frequently underestimate the need for school seats in neighborhoods where new projects cater to larger-sized families with larger apartment sizes, he argues. As a result, the city constantly underestimates the necessity for school seats in upper Manhattan, where apartment sizes are generally larger than in lower Manhattan. Shekar Krishnan of Brooklyn Legal Services Corporation A says the manual should include a “fair housing analysis”—a discussion of how the project would help to reduce racial and other types of segregation. Federal law already requires the city to document how it is furthering integration, but this is currently reserved to annual reports. The manual itself makes no mentionable references to segregation or race. And will the city heed any of these concerns in their forthcoming EIS for rezoning neighborhoods like Jerome and East Harlem? DeRienzo says that if they do not, Bronx stakeholders may sue the city on the grounds that the EIS fails to comply with the State Environmental Quality Review Act. He recognizes, however, that this is not a promising strategy, especially if the developer or public agency involved can argue they have followed the manual to the tee. The preponderance of such court cases have failed, with courts offering deference to the technical expertise of the manual. The administration sometimes goes to great lengths to defend the manual. In March, it got embroiled in a dispute between the parents of an Upper West Side elementary school, a non-profit nursing home that wanted to construct a new building across the street from the school, and the State Department of Health, which produced the EIS. The school parents argued that the State Department of Health had written an inadequate EIS that underestimated the dangers of construction to the school and failed to adopt adequate mitigation strategies. A judge ruled in the parents’ favor, the nursing home appealed, and de Blasio filed a brief in support of the nursing home, voicing the administration’s concern that the judge failed to defer to the authority of the manual. Yet while Brunner emphasized the manual’s validity, Director of City Planning (DCP) Purnima Kapur appeared to admit its imperfection, while also downplaying its importance, when asked whether it was time to revise the manual at a conference on displacement held on September 19. DCP did not respond to advocates’ suggestions for how the manual could be improved, but noted that the environmental review process is limited to an exploration of the effects of the proposed land-use change, and does not consider neighborhood trends that would exist regardless of the land-use change, which must be addressed through other city policies and initiatives. The Office of Environmental Coordination did not respond to requests for comment by press time. In other words, the environmental review process is supposed to play a vital role in a government’s decision-making process. Yet with no enforcement mechanisms to stop a plan if it results in negative impacts, and no clear way to define what it means to mitigate effects to the “maximum extent possible,” advocates say the EIS does often function as little more than a disclosure document. Elena Conte, director of policy at the Pratt Center for Community Development, says the city should do more to ensure the EIS’s proposed mitigation strategies are adopted, such as by including the strategies in the publicly accessible database of neighborhood commitments that the city says it will soon provide for rezoning neighborhoods. Yet Conte and other urban planners say they have a bigger concern: not the flaws of the technical manual or the difficulty of enforcing mitigation strategies, but that issues like school capacity and displacement pressures are not the aims of the initial neighborhood planning process, but left to be assessed at the end during the environmental review process. Of course, the de Blasio administration would dispute this characterization. It says it has made a conscious effort to ensure its plans are comprehensive “neighborhood plans” in which multiple agencies collaborate to ensure the proposed redevelopment includes new parks, transit infrastructure, affordable housing and other facilities. Yet Tom Angotti, a professor of urban affairs at Hunter College, says that the city could go even farther and deeper in the initial planning process, and provide calculations of how its proposed projects would affect neighborhood infrastructure well before the environmental review process begins. Furthermore, rather than deferring to the authority of city agencies or to a manual, he says each community board should have its own technical advisors to assist them with assessing the agency’s estimations. City Limits’ coverage of housing a development is supported by the Charles H. Revson Foundation and the New York Community Trust. EIS is a joke. It’s never taken seriously by developers or the city process. any attempt to derail a ULURP starts and ends at the local councilman. Here in Red Hook we are lucky to have one who cares, and who stopped a recent ULURP by insisting that a nursing home should not be built in a FEMA mapped flood zone. If not for him, it would have happened. Nobody is paying attention to the effect that all these new high-rise developments will have on NYC’s water & sewer infrastructure. Will the system be stressed to the point where water pressure becomes an issue? Will NYC’s aging sewage treatment plants be overwhelmed. The 2 plants here on S.I. are both about 60 years old, and I’m sure the plants in the other boroughs are even older. This 3,000 word essay really dances around this issue. This is what the EIS is all about – ensuring that infrastructure matches the increase in demand that comes with more people. But, that really doesn’t have a lot to do with this article. Instead, we get crazy social justice ideas that building new housing ins neighborhoods composed of slums and projects is racist. This is 21st century America. Witch hunts. Everything is a witch hunt. 1. Most states do not have an EIS procedure for rezonings. The few that do (such as NY and California) tend to have out of control housing prices. Nonsense. This article quite eloquently lays out the challenges in our collective land use decision-making. For far too long we’ve been primarily, bordering on exclusively, concerned with what developers and real estate interests want (money), rather than what communities (i.e. people) need. You cast all of these concerns as a NIMBY point of view, but that is truly unfair as it due to the actions of developers, speculators, unscrupulous landlords, other real estate interests, capital interests, and overly friendly regulatory bodies and government that gave rise to what you oversimplify as NIMBYism. If these interests cared about developing communities in way that respected and served residents, met their infrastructure needs, and respected and protected environmental resources, then NIMBYism wouldn’t exist (other than that which is based in racism, but even that could be chipped at). The underlying issue here is greed. NYC real estate interest simply want to make money, and make it fast. This is not a recipe for a great place to live. We can add more housing to the city in other ways which will allow more people of modest means to stay in the city, welcome newcomers and set an example for other cities to follow, which would lead to, not only more urban, energy efficient living, but more socially sustainable, equitable, resilient, and prosperous cities. So, it was racist to redline black neighborhoods in the 1950s, but now it’s racist to develop new housing in the same black neighborhoods? This makes no sense. The MTA is relocating its bus depot at East 126th Street so the city can create a memorial honoring the history of an African burial ground formerly located at the site. But the full plan calls for much more than a memorial. The city could use its seizure powers to facilitate the redevelopment of Far Rockaway. But a law firm’s promotional material has alarmed many property owners who are not even potential targets, the city says.